Boulevard Supply is your source to rent car show stanchions in Las Vegas. Our short black stanchions are non-obtrusive! At only 26″ high, these mini stanchions create a noticeable barrier around your car without blocking the views and camera shot of fans, photographers and auto enthusiasts. You put a lot of time, effort and money in to your show car. Taller stanchions detract from your car, truck or motorcycle plus they look bad in photos of your vehicles. Short stanchions are the way to go at an auto show or car auction. 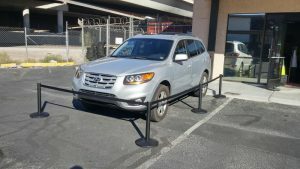 Whether you are in Las Vegas for annual SEMA car show or the Barrett Jackson auction or if you are a Las Vegas local showing off your car at a weekend event, we have short stanchions for rent or for sale.